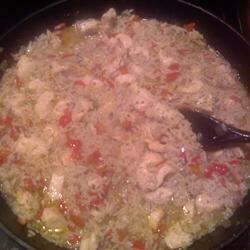 "This is one of my families favorite chicken dishes. It's easy, and everything is made in one pot. This mom likes that." Dredge chicken in flour, turning to coat all over. In large saucepan or Dutch oven, heat oil over medium heat. Brown chicken pieces about 8 minutes per side. Transfer to plate. Combine sausage, garlic, onion, peppers, tomatoes, sugar, thyme, oregano, salt, and allspice in the pan. Cook over medium heat, stirring occasionally, for 10 minutes or until peppers are softened. Stir in rice, and add stock. Nestle chicken into rice. Bring to a boil. Reduce heat, and cover. Cook for 20 to 25 minutes, or until liquid is absorbed and juices run clear when chicken is pierced. Serve sprinkled with parsley. Garnish with lemon slices if you like. I thought this recipe was rather bland to be considered "New Orleans". I had to add cajun seasonings. I don't think I would make again. My kids made this and it tasted awesome. Will definitely make this again. Different taste than the usual. For New Orleans to be in the name I was expecting a bit more cajun spices. It was great but I did add some cajun spices into mine and I was generous.